﻿﻿﻿﻿Following a major disaster, first responders who provide fire and medical services will not be able to meet the demand for these services. Factors such as number of victims, communication failures and road blockages will prevent people from accessing emergency services they have come to expect at a moment's notice through 911. People will have to rely on each other for help in order to meet their immediate life saving and life sustaining needs. ﻿﻿﻿T﻿he Community Emergency Response Team (CERT) Program ﻿﻿educates people about disaster preparedness for hazards that may impact their area and trains them in basic disaster response skills, such as fire safety, light search and rescue, team organization, and disaster medical operations. Using the training learned in the classroom and during exercises, CERT members can assist others in their neighborhood or workplace following an event when professional responders are not immediately available to help. 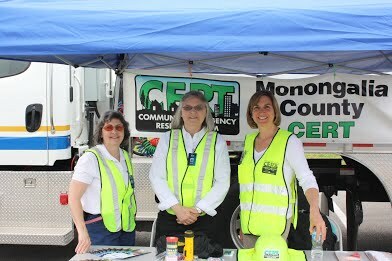 CERT members also are encouraged to support emergency response agencies by taking a more active role in emergency preparedness projects in their community. The CERT course will benefit any citizen who takes it. They will be better prepared to respond to and cope with the aftermathof a disaster. Civilian auxiliary responder groups can provide immediate assistance to victims in their area, organize spontaneous volunteers who have not had the training and collect disaster intelligence that will assist professional responders with prioritization and allocation of resources following a disaster. The Monongalia County Health Department will be offering a basic Community Emergency Response Team (CERT) class on May 5 & 6, 2018. To register for the course, click here.